The start of October brings with it our apple activities for preschoolers with free printables. This is definitely a unit that awakens the senses, includes many practical life activities, and aids in fine motor skill development. Here's what we're up to! Bulldozer struggles with writing. As we've introduced the alphabet this year, it's taken two weeks to conquer writing each letter. We're now switching gears and using a sand tray to practice writing letters. 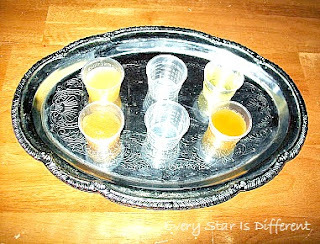 Red, yellow, and orange glitter, as well as cinnamon have been added to the tray, to make it more festive for Fall. I can't believe how much using the sand tray has improved Bulldozer's writing abilities. He practices writing all of the letters we've learned this year each time he selects this work. 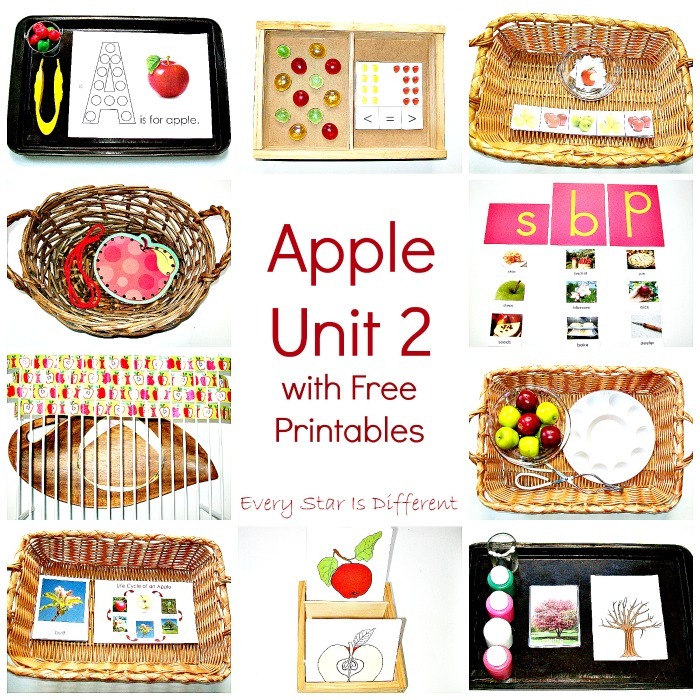 Source: The upper and lowercase alphabet cards can be found for free at Homeschool Creations. We've been studying the Montessori Green Series and phonograms lately. Right now we're focusing on the long "U" sound. Dinomite thoroughly enjoyed sorting these cards. 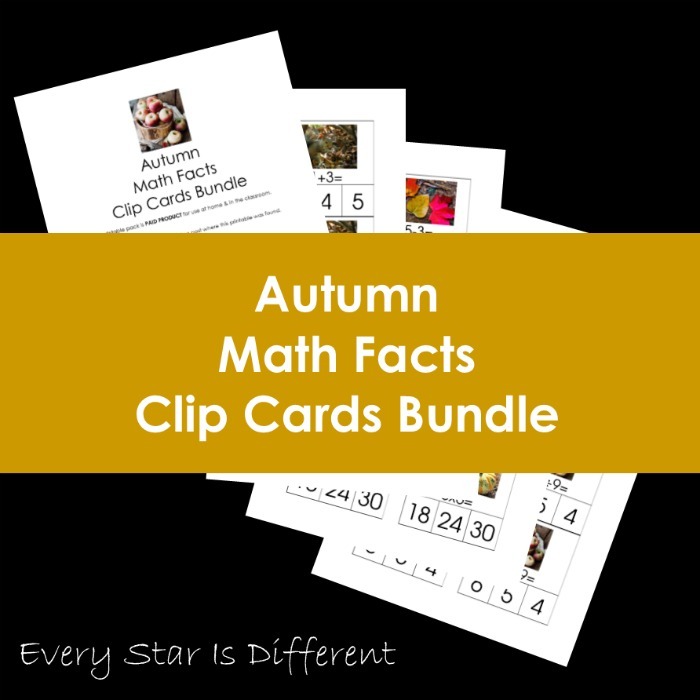 Source: I created the printable for this activity. For your free copy of these and other Montessori Green Series printables, click HERE. My boys despise writing. Many activities on our shelves are designed for them. This one was designed with Princess in mind. She loves to write. The kiddos will write the missing letters in each of the words provided. A control is available if they need it. 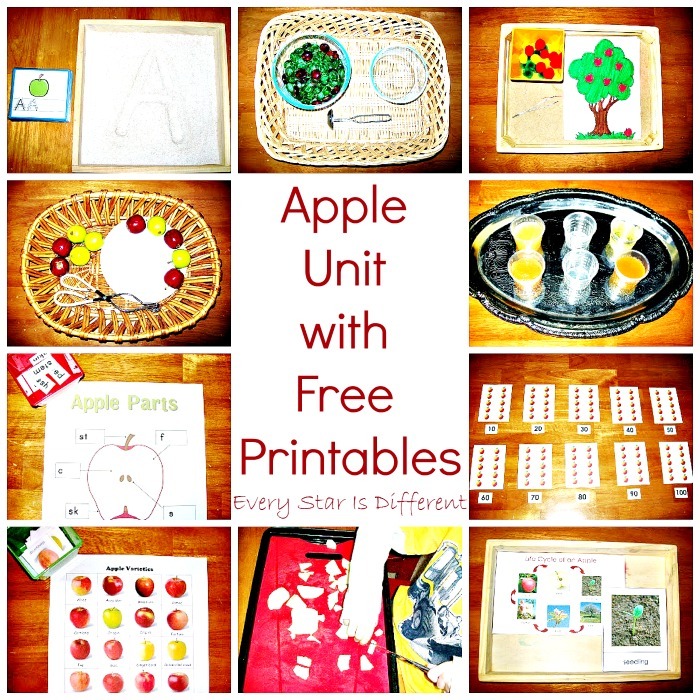 Source: I created the printable for this activity. Click HERE for your free copy. All three kiddos know how to count by tens, while singing a song. I wanted to see if they could apply their knowledge. They're doing quite well so far! Source: I created these cards. For your free copy, click HERE. The kiddos now know how to write all of their single digit numbers. Hooray! Since it's been a while since we've written some of our numbers, I decided to provide a refresher. 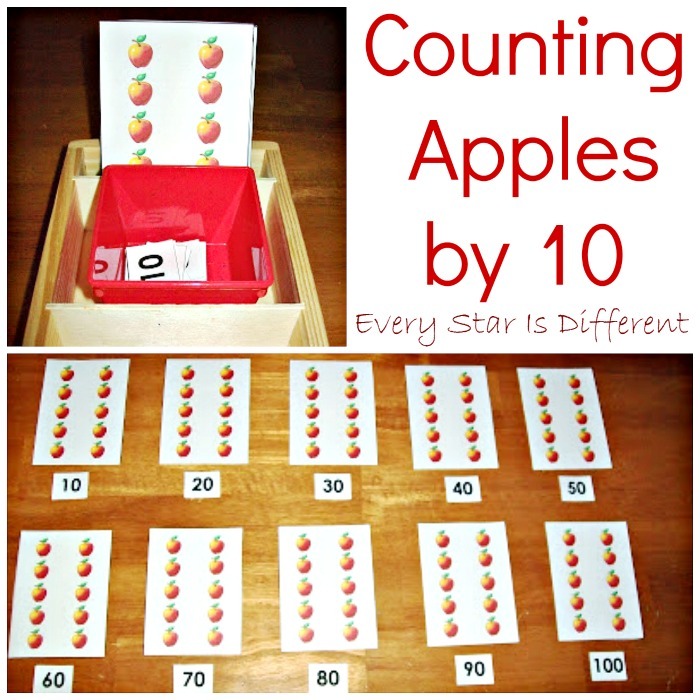 Source: The printable for this activity can be found at Homeschool Creations. All three kiddos are working on their addition skills. 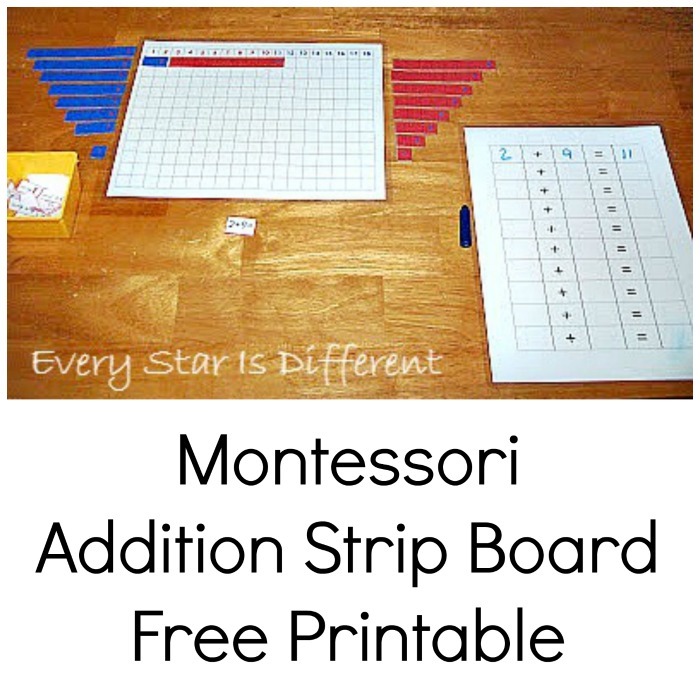 After many other failed attempts to help them improve their skills, I've turned to the Montessori Addition Strip Board for help. I do not have an addition strip board, nor do I have the funds to purchase one right now. Instead, I made my own. The board I have created fits on an 8 x 11 sheet of paper. It fits perfectly on one of our trays. I printed out all of the pieces on card stock and then laminated them. The homemade material is working fabulously. When I showed Dinomite how it works, he was SO EXCITED! Princess selected this activity off the shelf before any other activity. I am so thankful for Maria Montessori, her work, and materials. 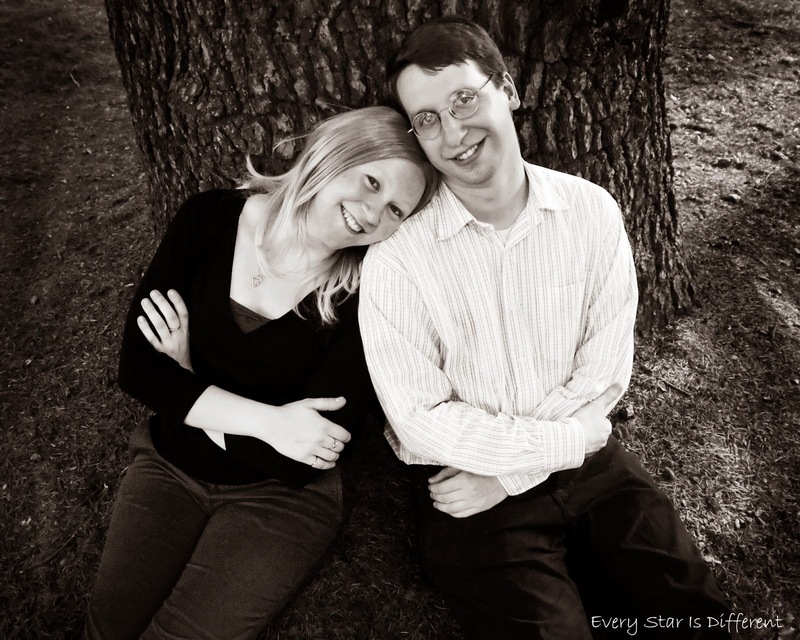 They have benefited my children so much. Source: I created this addition strip board. For your free materials, click HERE. For the free addition problem recording sheet, click HERE. This month we're studying South America. I am unable to have the kiddos do the typical flag/country activity with toothpicks or other objects, because of Bulldozer's adhesive allergy. I have no way of attaching the flags to the toothpicks. So, instead, I created match up cards for each country with their flag. 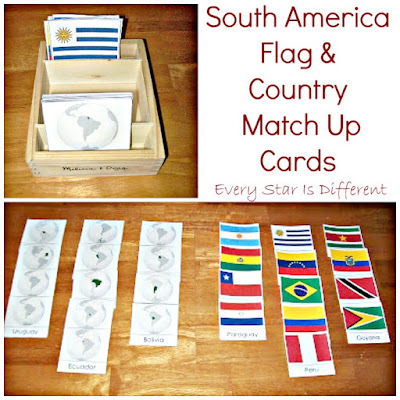 Source: I created the printable for this activity. For your free copy, click HERE. We went apple picking as a family for the first time on Saturday. It was a BIG deal. Bulldozer was allergic to apples up until he was 3 years old. We are so thankful he outgrew this allergy. Bulldozer loved picking the apples. It wasn't until three out of four bags were full, that he decided to start chucking them. Dinomite has had opportunities to go apple picking, but has refused due to anxieties, sensory issues, etc. This year he finally decided to try it. We are so proud of him! Sunshine, had an apple in her mouth at all times. When she accidentally dropped one she just picked another. She was super cute! Princess had fun as well. Every time the wagon went over a bump she shot up about 4 inches. Each day this week we're making a different apple treat. Tonight we made apple cake with cinnamon cream cheese frosting. Bulldozer likes this activity because it's easy. The kiddos already seem quite knowledgeable about the parts of the apple. The only parts they didn't know were the core and flesh. Source: I found this free printable at 2 Teaching Mommies. The kiddos have enjoyed arranging cards in the order of the life cycle of an apple using the control above. 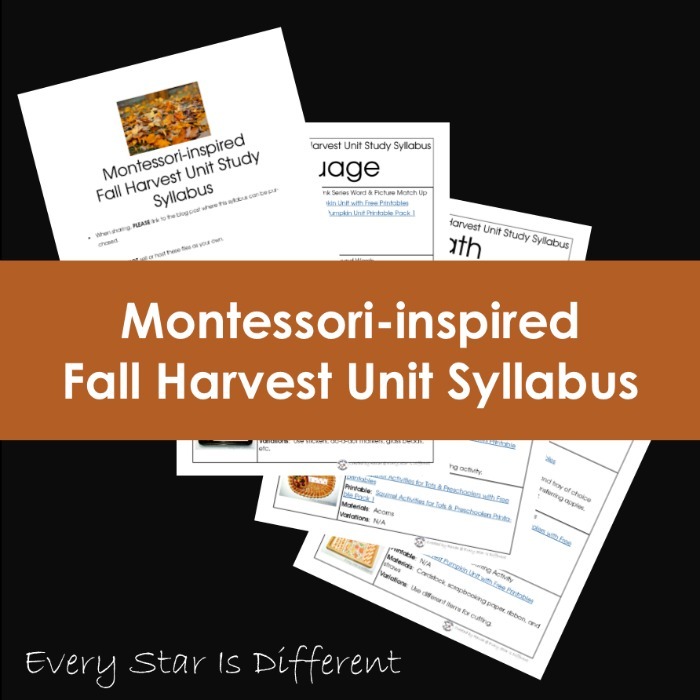 Source: I found this free printable at Montessori for Everyone. 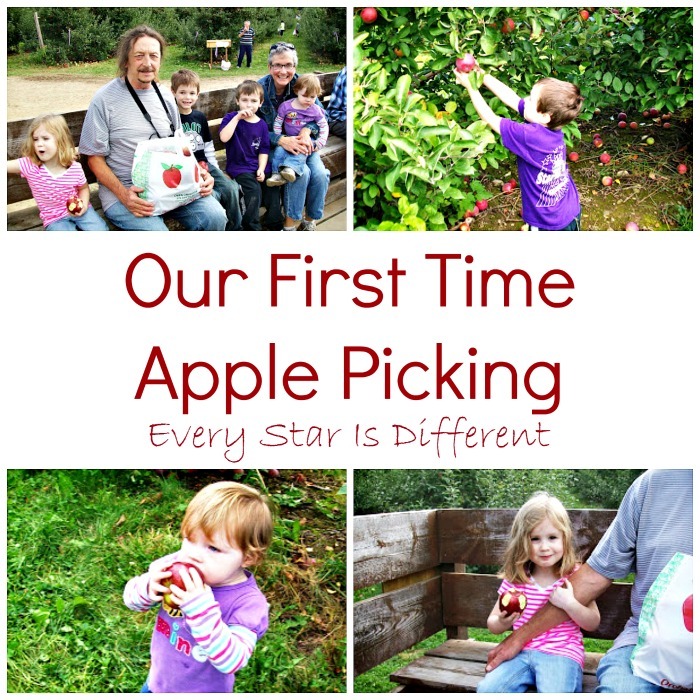 The kiddos were pretty amazed by how many different kinds of apples there were at the apple orchard. At the same time, they're super picky about their apples. I thought it would be fun for them to match up apples using this chart. 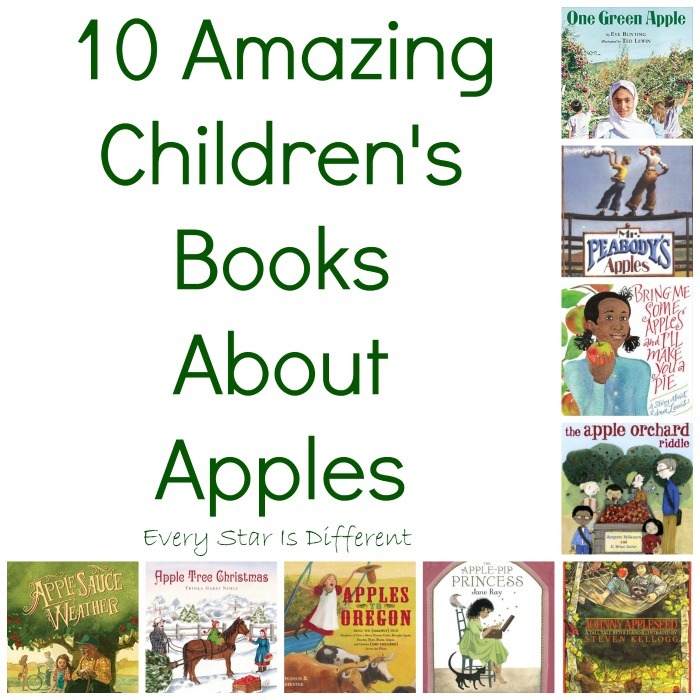 It came as no surprise that Dinomite picked out the exact apple he prefers on the chart, without knowing it's name, because of it's distinct color. He has such a good eye for details. In case you're wondering, he will only eat Fuji Apples. 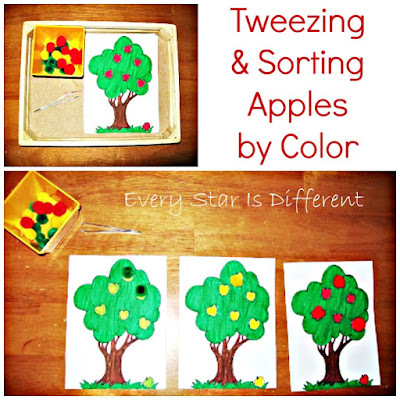 The kiddos practice their cutting skills while doing this activity. I peel and slice the apple up into quarters. The kiddos then cut the apple into tiny pieces that were used for our apple cake. The kiddos practiced slicing an apple. None of them can do it on their own yet, but they did try! Apple tasting will be on ongoing thing this week. In this picture there are samples of unsweetened applesauce, cinnamon applesauce, apple juice, and apple cider. Missing from the picture are two different apple slices. Bulldozer LOVES to peel carrots. He was super excited when he saw this activity. However, all three kiddos are really struggling to peel the apple. The coordination is tricky and then to add muscle strength... I'm hoping they keep trying! I love my little plastic apples. They work for so many things! 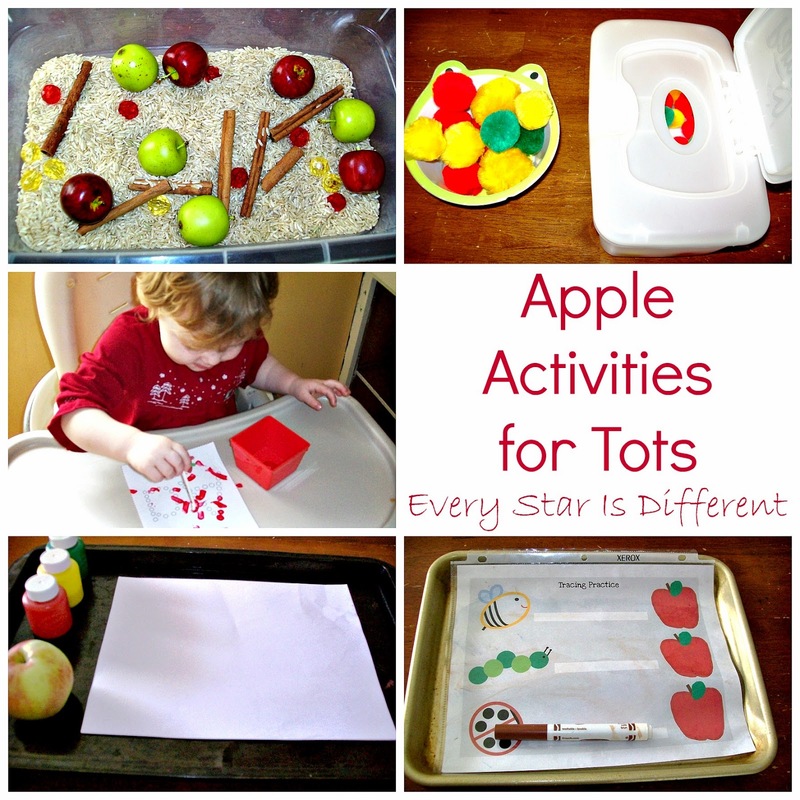 In this activity the kiddos use the tongs to transfer the apples from the basket to the tray. Bulldozer decided he was going to roll the apples across the room, and then go and pick them up using the tongs. He always has his own ideas about things. 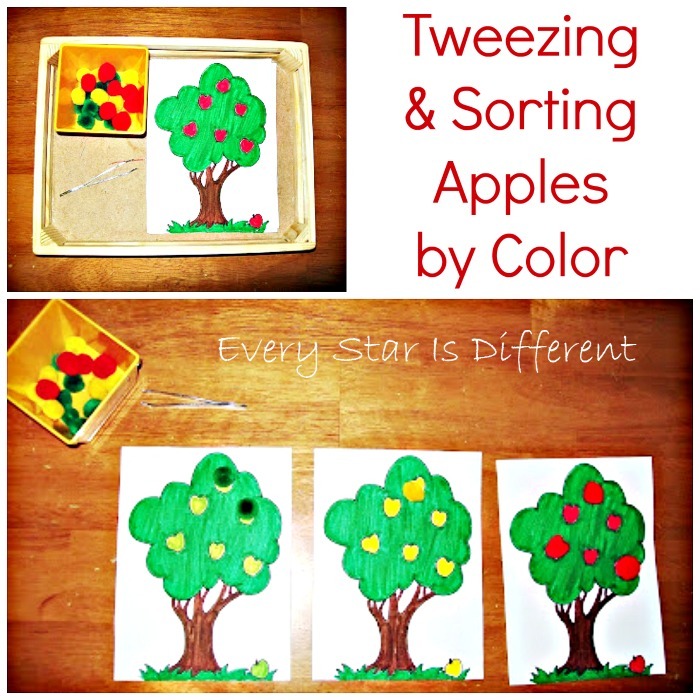 The kiddos use the tweezers to pick up the pom poms and place them on the trees. This activity is much harder than it looks. Princess did a great job with it today. Source: I found the apple tree coloring page at coloring.ws. The kiddos will remove the red "apples" from the bowl using the spoon provided. The goal is not to use their hands. I've been impressed at how well they've done with this so far. 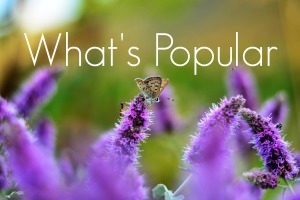 If you're interested in more apple themed activities, be sure to visit the post below. What awesome ideas for homeschool! Thanks! Thanks for inviting Melinda! Will do!